Note that basically you can use any kind of bread for frying. 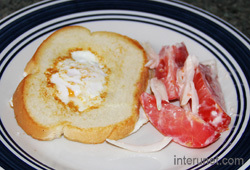 However, usually soft breads work better with this easy and fast making breakfast dish. Put the ingredients in an easy reachable place near the stove. 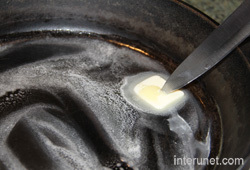 Melt butter on a fry pan and spread it all over the pan using a kitchen knife or spatula. 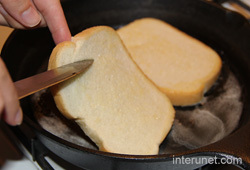 Place both slices of bread onto the frying pan. Flip those pieces over right after. That way both sides of the slices will be butter covered fast and easily. 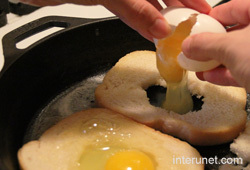 With the help of a knife, make about an egg big holes in the bread. 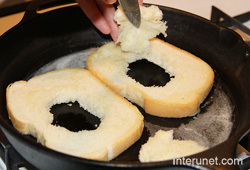 Remove the inner sides of the bread slices and place them to fry aside from the main pieces. Do not throw away them, they will taste good also. 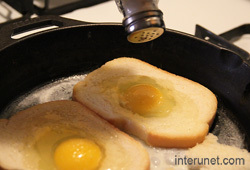 Break each egg into the bread hole. 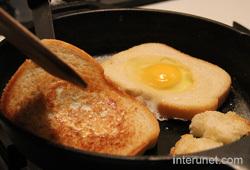 Those who are not comfortable with egg breaking directly onto the fry pan, they can crack eggs into a bowl first and then add them onto the pan. That way your dish might look even neater. Salt each egg by taste. You can do it just from one side. That should be more than enough. 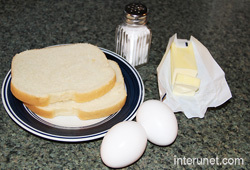 When you will see that the bottom of your eggs became tender, flip each piece with a spatula and kitchen knife. Do not wait until the egg will be cooked entirely. Usually you will get one side of bread browner than the other one. The longer you will keep the bread frying the harder the egg will get. Some people like just slightly fried eggs where the egg yolk is still as liquid. This easy and fast breakfast or lunch you can enjoy with some salad. For the salad, you can wash one tomato and pill one small onion. Chop and salt everything together. Add some salad dressing or mayonnaise.